Daniels provides the construction details for a 'wobble stick' in his book, Watchmaking. 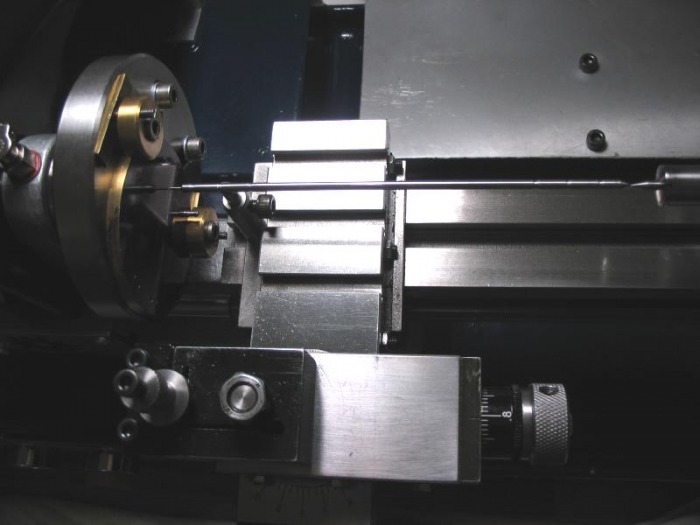 It is used to accurately center a component in the mandrel or faceplate on the lathe. It is a very simple tool, and is described in various other texts as well. A sharpened piece of pegwood on the T-rest is shown in some books. 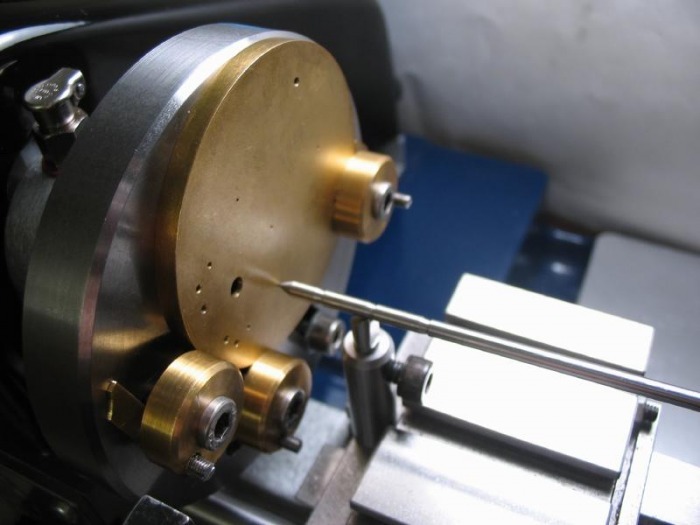 Daniels method uses 3mm drill rod which is given a 50 degree point on each end, one end being reduced to 1mm for small holes. From each point a 15 degree taper is grooved at 10, 20 and 30 mm. These tapers are where the stick can rest in the forked support on the lathe bed. He describes a T-rest attachment. Since the Cowells cross slide carriage has a mounting position, which is approximately on center, I decided to make an attachment which affixes to this hole and has an adjustable forked support. Daniels suggests a finished length of 210mm, however the between center limit on the Cowells is 8" (203mm), so my wobble stick will need to be a bit shorter than that. He specifies this length so that the ratio of length to the first groove will be 20:1, and then a ruler can be used at the 'wobbling' end to roughly calculate the eccentricity of the hole. For example, if the stick is wobbling 2mm, then the hole is approximately 0.1mm off center. As it is, with the chuck adapter and faceplate in place and to allow for attached work, I decided on a stick of 150mm in overall length, this results in a ratio of 14:1 at the first position. Not an easy calculation to do in one's head, but at least the concept can be maintained. The idea with this value is that one can know if an acceptable tolerance has been reached, but in practical use the work is adjusted until little to no 'wobble' remains. 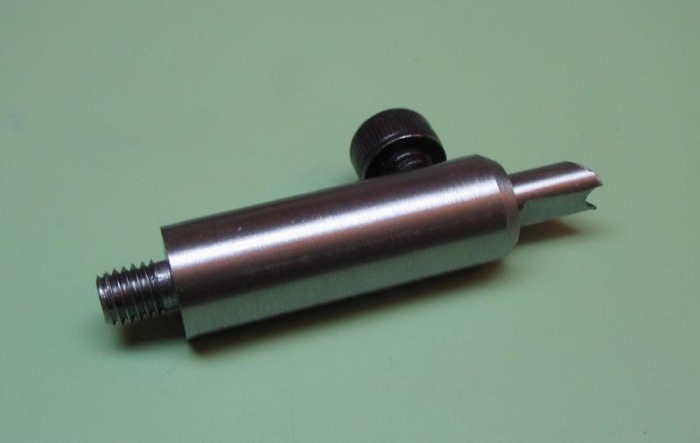 The support is made from 10mm O-1 drill rod, turned and threaded for the 5mm carriage mount. The top is bored to 5mm and threaded for a set-screw in the side. The adjustable fork is made from 5mm O-1 drill rod, which was drilled in situ, to mate with the wobble stick and filed to shape. Just to test its function, I placed a female center in the headstock and tried it out.